SPICKARD, Mo. - It has happened before, but always surprises. 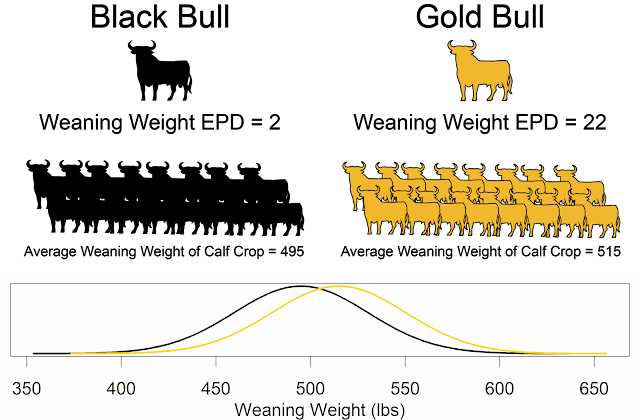 The biggest, best-looking beef cows had the worst genetic scores. At the University of Missouri Thompson Farm Field Day, eight cows were sorted out for study by farm visitors. Four cows were top of the herd. Four were on the bottom. They were sorted on genetic value scores from DNA testing. Cows that looked the best to visitors who didn't know the scores were large frame in good condition, but their calves at side were light-muscled and less fleshy. Jared Decker, MU Extension geneticist, said the bottom-scoring cows were ready to "go on down the road." They will be replaced by heifers from high-scoring younger cows. The soon-to-be cull cows had not produced prime-grade calves like the high-scoring cows, Decker said. Farm manager Jon Schreffler agreed with results from the GeneMax Advantage tests. The high-scoring cows also had high scores in herd records he keeps to track profitable cows on the farm. Earlier in the field day, Sept. 15 at the farm in northwestern Grundy County, Decker told of genomic testing. All females in the MU Thompson cow herd were genotyped. Commercial testing services determine the DNA profile based on a few drops of blood. With new technology, top animals can be found early in life before producing their first calf. David Patterson, MU beef reproduction specialist, told of research at the farm since 1998. His experiments refined use of fixed-time artificial insemination. Now those AI protocols are used on farms nationwide, even worldwide, he said. Patterson's graduate students told of new research to refine AI breeding. With fixed-time AI, all cows in a herd can be bred in one morning. That results in less labor and uniform calf crops at weaning and marketing. All MU steers are sent to a feedlot for finishing. That's when cutout sheets come back from packing plants showing that Thompson calves now rate prime and high choice by USDA graders. In current quality beef trade, premium prices are paid by packers for high- grade carcasses. More producers across Missouri are following that plan to retain ownership so they can collect high beef prices, plus premiums. Our goal was to improve AI breeding protocols and produce beef for the "white tablecloth trade," Patterson said. By knowing genetics of cows and herd sires, matings can be matched to improve the herd as well as improve calving ease and other important traits. Improved maternal genetics led to adoption of the Show-Me-Select Replacement Heifer Program across the state. After improving development of replacement heifers, it became clear that steer mates to the heifers also had added value, Patterson said. 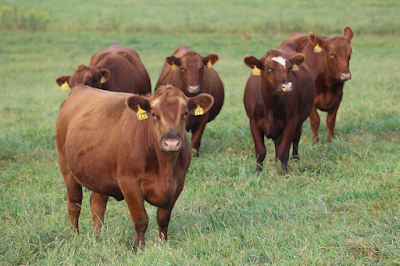 With progress in genomics, the mapping of DNA of the beef animal, it is possible to study genetics of all animals in the University of Missouri herd. Allison Meyer, MU ruminant nutritionist, told the need for quality feed for pregnant cows. The cow's diet provides nutrition for prenatal calves. "The cow's nutrition has lifelong impact on the calf," she said. With so much late-cut, low-energy hay this year, Meyer urged farmers to test their hay before winter-feeding season. "There's never been a time when a $20 hay test can add so much value to a herd." Poor hay can lead to cows not breeding next year, she warned. Farm superintendent Rod Geisert said the field day gave a wide range of topics from economic outlook to prices for timber sold to loggers. The event ended, on a windy day, with what Geisert called "an exciting controlled burn" on a grass field. The research farm is part of the MU College of Agriculture, Food and Natural Resources. Information on AI breeding and replacement heifers is available from regional MU Extension livestock specialists.